God knows what we have need of even before we do, and although the world seeks after what they should wear or eat we are told to seek after the kingdom of God for as His flock He will add to our lives all we have need of. (Luke 12:27-34). Consider the lilies how they grow: they toil not, they spin not; and yet I say unto you, that Solomon in all his glory was not arrayed like one of these. If then God so clothe the grass, which is to day in the field, and to morrow is cast into the oven; how much more will he clothe you, O ye of little faith? And seek not ye what ye shall eat, or what ye shall drink, neither be ye of doubtful mind. For all these things do the nations of the world seek after: and your Father knoweth that ye have need of these things. But rather seek ye the kingdom of God; and all these things shall be added unto you. Fear not, little flock; for it is your Father’s good pleasure to give you the kingdom. Sell that ye have, and give alms; provide yourselves bags which wax not old, a treasure in the heavens that faileth not, where no thief approacheth, neither moth corrupteth. For where your treasure is, there will your heart be also. When God guided His people out of Egypt in His eyes they were as a flock of sheep that was being led to safety! (Psalm 78:52-55). 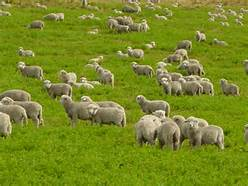 But made his own people to go forth like sheep, and guided them in the wilderness like a flock. And he led them on safely, so that they feared not: but the sea overwhelmed their enemies. And he brought them to the border of his sanctuary, even to this mountain, which his right hand had purchased. He cast out the heathen also before them, and divided them an inheritance by line, and made the tribes of Israel to dwell in their tents. We are the flock of His pasture. (Ezekiel 34:30-31) Thus shall they know that I the Lord their God am with them, and that they, even the house of Israel, are my people, saith the Lord God. And ye my flock, the flock of my pasture, are men, and I am your God, saith the Lord God.